The Southern Ohio Museum and Cultural Center (SOMACC) is currently showcasing a juxtaposition of art that spans 100 years. Each of the two galleries have drastically different art methods that highlight its own take on a century of art. The Richards and Mehser Galleries will be showing Click!, an exhibit that spans cameras between 1897 and 1997. The Kricker Gallery, is the focal point of the exhibitions, in which SOMACC Artistic Director Charlotte Gordon herself stepped in and curated one of the largest Ohio watercolor exhibits ever put together. The watercolor show is called From River to Lake: A Century of Ohio Water color. The artwork spans the years 1915 to 2015 and showcases the most influential and important pieces of watercolor art completed by Ohio artists. The show has appeared in two locations, Columbus and Portsmouth, and will be dismantled in July. 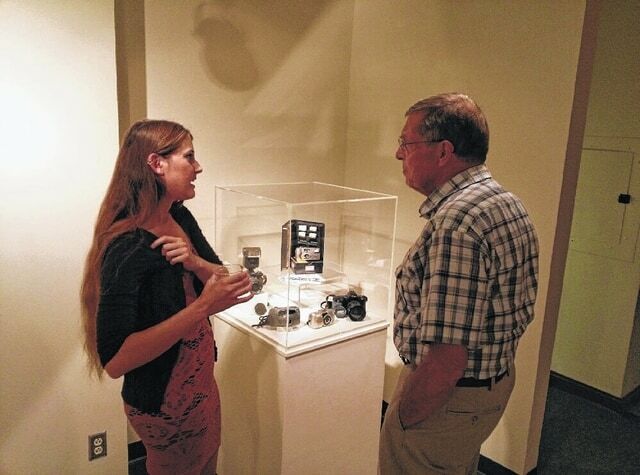 The exhibit was curated specially for the Ohio Arts Council (OAC), where it made its debut. It consists of dozens of selections and even has Scioto County ties with artists such as Charlie Clevenger and the late Lane Raiser. Gordon said that the gallery took 18 months to assemble and was in honor of the OAC’s 50th anniversary. “The paintings in this exhibition are as varied as the state itself, from the southern tip on the banks of the Ohio River to the northern edge on the coast of Lake Erie. Spanning the years 1915 to 2015, we are able to see not only the breadth and depth of painting talent for which Ohio is recognized, but also the versatility of the medium,” Gordon said. Many of these paintings are of outdoor scenes, which isn’t uncommon of famous American watercolor paintings. This trend might also be thanks to Ohio, since many artists hailed within its territory for some time in the early 1900s and outdoor scenes have commonly been a theme of Appalachian artwork. “Of all the states between the East and West coasts, it was Ohio that developed the greatest and most continuous artistic tradition before 1920,” art historian, William Gerdts said, which Charlotte mentions in the discussion of Ohio art. Gordon said that because many of these artists lived along the waterways, they generally knew each other and picked up on other tips and tricks and adopted it in each others work, which can be seen in some of the work. Gordon said that Click! is also an exciting gallery for the museum, because it has become a new permanent collection for the museum. The museum sees this as such an importance, because the keystone of any museum is preservation before showcase, which is where permanent collections play a role. The collection harbors over 100 years of changing technology, industrial design, and photographic needs. The collection consists of cameras, lenses, and other ephemera. The Southern Ohio Museum and Culture Center is at 825 Gallia Street, in the heart of Portsmouth’s downtown, and has two entrances. The museum is open Tuesdays through Fridays from 10 a.m. to 5 p.m. and Saturdays from 1 to 5 p.m.; Closed Sundays, Mondays and major holidays. Tours are offered by scheduling. A museum official can be reached at 740-354-5629. “We are covering very drastically different mediums, not quite overlapping exactly on the year, but in the same centuries,” Gordon said. “It is a unique experience and I think everyone who has visited has enjoyed their time here.